JOIN US FOR AN EVENING WITH ILYASAH SHABAZZ, community organizer, social activist, motivational speaker, author, and third daughter of Malcolm X and Dr. Betty Shabazz. The Alonzo F. and Norris B. Herndon Foundation is excited to host Ms. Shabazz, author of award winning publications such as: Growing Up X (Random House 2002), a coming of age memoir; Malcolm Little: The Boy Who Grew Up to Become Malcolm X (Simon & Schuster 2014), a children’s illustration book; and X, A Novel (Candlewick Press 2015) a young adult historical fiction book, at a book signing on Friday, July 15, 2016 from 6:00 p.m. to 8:00 p.m., at the Herndon Home Museum, 587 University Place NW, Atlanta, GA 30314. Ilyasah Shabazz will read excerpts and sell signed copies of all three of her award winning publications. HURRY AND MAKE YOUR RESERVATION – TICKETS ARE GOING FAST! This is a rare opportunity to meet a descendant of one of the most important names in American history! To learn more about Ilyasah Shabazz check out her biography here. To reserve your ticket, go to http://herndonhomemuseumhostxthenovel.eventbrite.com. For more information, contact Jennifer Dobbs Hill, Executive Director, at 404.581.9813 or jdobbshill@herndonhome.org. February 16 book Signing Event with Kenneth B. Morris, Jr.
JOIN US FOR AN EVENING WITH KENNETH B. MORRIS, JR., great, great, great grandson of Frederick Douglass and great, great grandson of Booker T. Washington. 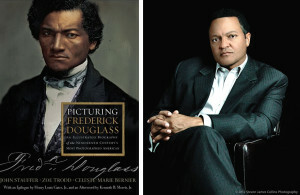 On Tuesday, February 16, 2016 from 6:00 p.m. to 8:00 p.m., Kenneth B. Morris, Jr., president of Frederick Douglass Family Initiatives (FDFI), will speak about his distinguished lineage and sign copies of the book, Picturing Frederick Douglass, at the Herndon Home Museum, 587 University Place NW, Atlanta, GA 30314. Not only will attendees have the opportunity to purchase the beautiful hard copy, but they will also receive two signatures – his and that of his mother, Nettie Washington Douglass, the first to unite the two famous bloodlines, who will also be in attendance. HURRY AND MAKE YOUR RESERVATION – TICKETS ARE GOING FAST! This is a rare opportunity to meet descendants of two of the most important names in American history! Visit the Herndon Home Museum during the Atlanta Preservation Center’s 13th annual The Phoenix Flies: A Celebration of Atlanta’s Historic Sites event, which provides an opportunity to learn about, celebrate, and strengthen Atlanta’s historic built environment of buildings, landscapes, and neighborhoods, to the benefit of all. There are only 20 spots available for a tour each day, so please submit your reservation soon to 404.581.9813 or tours@herndonhome.org.